Hyundai Motor Executive Vice Chairman Chung Eui-sun has been named co-chair of the Hydrogen Council, a global alliance of hydrogen technologies launched to promote the energy transition from fossil fuels, the organization said Thursday. 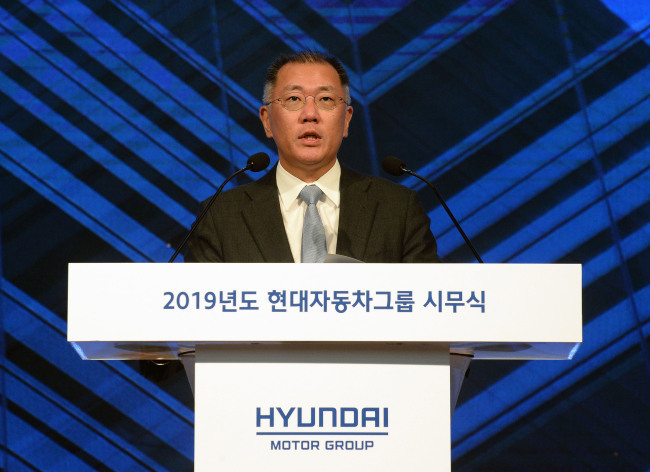 Chung replaces Yang Woong-chul, a former vice chairman of Hyundai Motor who left the carmaker late last year, and joins incumbent Co-chair Benoit Potier, chairman and CEO of Air Liquide, to lead the council for the next two years. Established in Davos in 2017, the council is a first-of-its-kind global CEO initiative to foster the role of hydrogen technologies. Its members comprise 33 leading multinational companies. In a contributing article, Chung called for concerted efforts to build a global ecosystem in which governments and the private sector work together to realize a hydrogen economy. To seek a major shift in the energy paradigm, fresh investment worldwide worth around $280 billion will be needed by 2030 for the development of hydrogen technology. “We need policies and incentives that make it possible for industry players to develop and deploy technology within and across regions, for investors to infuse capital in projects that need it most, and for civil society to access these innovations at a reasonable price,” he said in the article jointly published with co-chair Potier.